This was a banquet from 500 Vegan Recipes. I hadn’t made any of the dishes while I was testing for the book, but I’d had them pencilled in since my copy of the book arrived. I had some of the aubergine relish left over from the biryani wreath and I thought this was a be a good way to use that up at the same time. The whole meal was delicious and went together beautifully. If I had to pick a favourite part I’d probably go for the cauliflower masala – simply because I don’t eat cauliflower very often and this was a very unusual and tasty way to make it. it’s the thing that loks a bit like porridge in th picture but take my word for it it tastes nothing like porridge! The potatoes were wonderful for something so quick and easy and would work with a whole range of other side dishes. Yet another set of winners from this brilliant book. 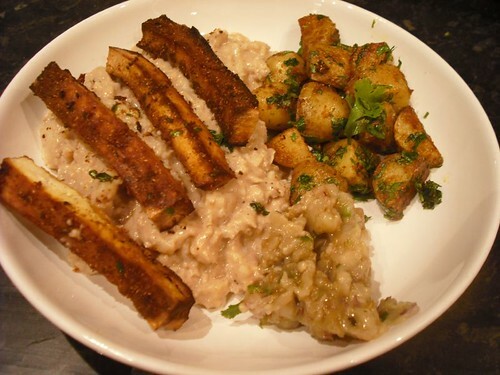 This entry was posted in 500 Vegan Recipes by efcliz. Bookmark the permalink. Please,can you come over and cook for me?